Twill & Birch knows you have your own design statement to make, so we’ve curated a home décor collection in easy-to-live-with, contemporary styles. Select from a variety of casual botanical, floral or geometric patterns in soft earth tones that add the perfect note of understated elegance to your transitional aesthetic. 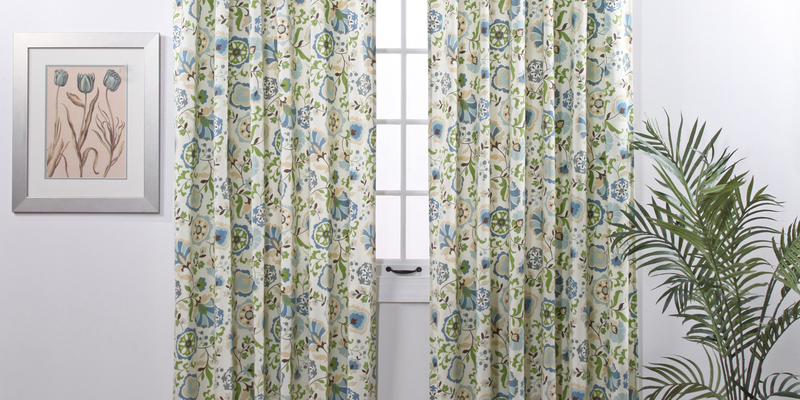 Opaque or sheer curtains in relaxed, neutral tones like sea foam and chrome are available in rod pocket, back tab, or grommet styles for easy hanging. And whether your sensibility leans toward spare modern or casual luxury, you’ll find our versatile quilted bedspreads (in reversible floral, solid or geometric) right at home. Mix or match pillow shams and decorative pillows to add contrast or pile on more cozy comfort. Sophisticated without being fussy, Twill & Birch’s collection of bedding and drapery effortlessly harmonizes with your vintage finds and family heirlooms to express your signature style. Belle Maison USA LTD is a family-owned home décor business established in 1979 and based in New York City. We have grown and diversified from our line of decorative fabrics by the yard to include ready-made products sold to major online, catalog, and brick-and-mortar retailers. Belle Maison USA LTD is the parent company of five unique lines of ready-made home furnishing products — Renaissance Home Fashions, Stylemaster, Twill & Birch, Colorfly, and Everdark. These distinct product lines offer original window treatments, bedding, and home accents to satisfy nearly every design sensibility and budget. Belle Maison Textiles, Inc. is also a distributor of high-quality fabrics by the yard to wholesalers serving the interior design trade, large retailers, and manufacturers. Both Elie’s father and grandfather had run textile businesses, and Elie started with a small wholesale fabric business based in New York City. He gradually moved his business upmarket, importing higher-quality fabrics from his European manufacturing contacts and expanding into ready-made home furnishing products. In true mom-and-pop style, Ethel put her organizational skills to work, running a one-woman back office from home while raising their son James, and later, daughter Liz. As the kids grew up, Ethel moved her work to the office, where she continues to oversee human resources and accounts receivable — but she still prepares lunch every day, a meal where the family puts aside the daily grind to stay connected to each other. James Romano joined Belle Maison right after graduating from SUNY/ Binghamton in 1994, and he hasn’t looked back. He worked in the warehouse as a kid, learning the business from the ground up, and while his parents never pressured him, he always knew he wanted to join the family business and “build something of value. Small companies have to be nimble, and James has worn many hats, directing warehouse operations, sales, and vendor and customer management. His primary focus now is applying his expertise in supply chain management to increase efficiencies, drive product innovation, and grow the business through retail, catalog, and online outlets. A strong growth period in the 80s was followed by another major change. Again, Elie saw it coming: the European manufacturing industry he had relied on (he once owned a mill in Spain) wouldn’t be able to compete with Chinese manufacturers, and Belle Maison moved much of its manufacturing to China. More growth was fueled by the acquisition of the Stylemaster brand and the creation of Renaissance Home Fashions and Twill & Birch, adding retail distribution and catalog sales to the mix. The youngest child, Liz Romano, was the last to join the family business, where she found a creative home. Trained as a photographer at the Rhode Island School of Design, Liz joined Belle Maison in 2000 and immersed herself in daily operations for several years. Then she became “a catalyst to streamline the brands and move the business into a focused direction,” says James. Liz rebranded existing product lines, jumpstarted the company’s marketing strategy with updated packaging and ads, and created the company’s first in-house design studio. Drawing on an exclusive pattern archive, the talented design team put their collective passion and expertise together to create Belle Maison’s fourth brand, Colorfly, to appeal to a more upscale, design-savvy customer. Photography and Textile Design ©2015 Belle Maison USA Ltd.